Tired of throwing away that perfectly good craft material? Start repurposing it, start having crafternoons, start having fun. Have space in your back yard? 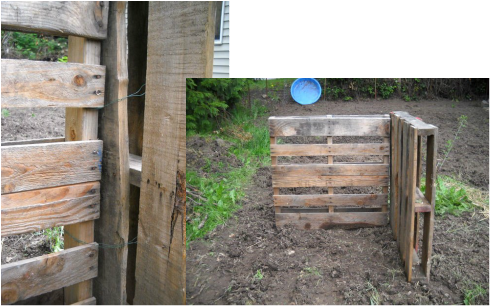 Build this recycled compost bin system! This 3-bin system has easy access to your compost for turning and can hold a large amount of material. The result is an efficient, easy to make, and most importantly inexpensive compost system. Gather a few old pallets (3 for a one bin unit or 5 for a two bin unit), some wire or strong rope. This bin will last for years and can be moved if needed. Now you are ready to start adding table scraps, grass clippings, leaves, and other yard debris to one bin. Have you ever looked at an item and thought, "that could be turned into something"? Your opportunities to recycle by reusing materials in some creative or new way are limited only by your imagination! 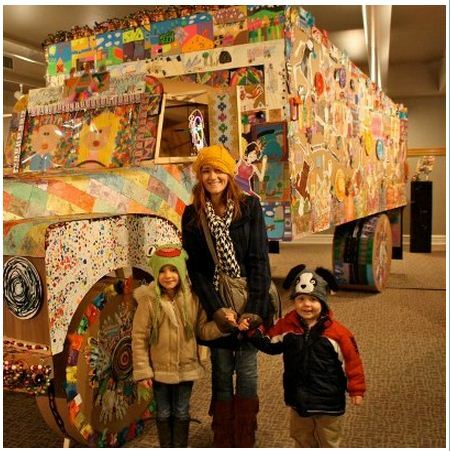 "Cargo Truck" recycled art by Missouri artist Carla Steck and area school kids. Facebook: Art Inside the Park. Don't keep all the fun to yourself; share your favorite DIY project sites with others! We will post the best ones on this website -- so check back often. 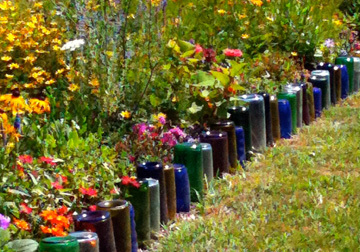 Be creative with empty bottles and make a decorative boarder that catches your eye and the sun. Don't throw away plastic bags! You can recycle plastic bags at most big retail outlets and grocery stores. 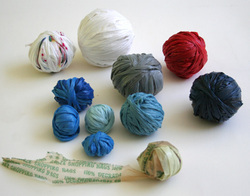 You can also use those plastic bags to create "yarn" from which you can make a number of cool items. For simple instructions on how to make plastic yarn and a variety of beautiful items, including bags and purses, click here. Americans use 2.5 million plastic bottles every hour. Carry your own water bottle, hot and cold beverage containers and save money while helping the environment. If you do purchase beverages in plastic containers, be sure to recycle! These are high-value plastic and have a number of uses. 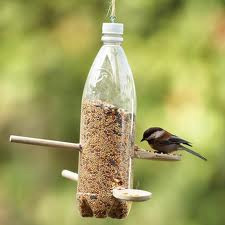 Another idea is to craft a bird feeder out of plastic beverage bottles! These bird feeders are fun and simple to make. A great way to occupy the kids on a winter day is to make a feeder then watch the birds it attracts! Read the full instructions here. Who needs expensive organizers? Old baking pans or cookie sheets can be decoratively painted to match your decor and used for all kinds of things. 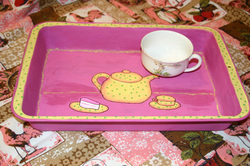 Here a cake pan was transformed into a hot beverage service tray for home or office. Cookie sheets (not shown) make a nice crafting surface for adults or kids. Possibilities are endless!